The high-speed, high-accuracy Megaturn Smart series of vertical turning lathes has been announced by Yamazaki Mazak Corporation. 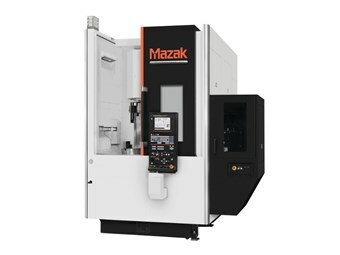 Yamazaki Mazak's Megaturn MTS500 lathe. Two sizes are available: The Megaturn Smart 500 has a maximum turning diameter of 500mm, while the 600 model increases that to 600mm. Both are available with rotary tools mounted on the turret as well as a mirror-image version to facilitate factory floor layouts. All are equipped with a rigid, integral spindle/motor designed for high-accuracy machining, while roller liner guides provide the rigidity for heavy-duty machining. An automatic tool changer and separate tool magazine for boring bars are available as optional extras. Their use, Mazak says, "eliminates tool interference that is frequently encountered when multiple boring bars are mounted on a VTL turret". The company says its Mazatorol Smart CNC system — which "provides unsurpassed conversational programming as well as ease of operation" — comes as standard. Click here to find Mazak lathes for sale.